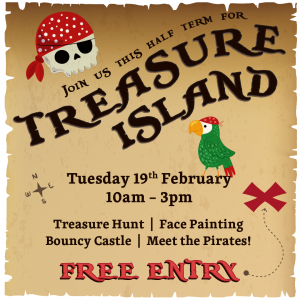 On Tuesday 19th February, from 10am – 3pm, Anglia Square will be transformed in to Treasure Island! 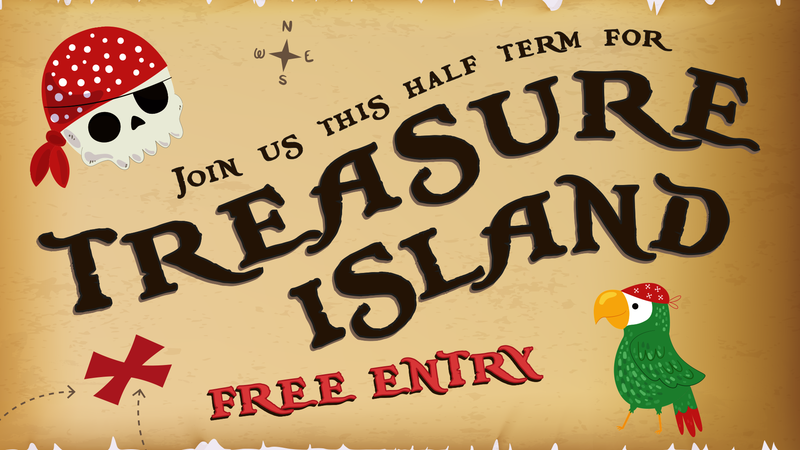 Join us for a FREE family swashbuckling day of fun with a treasure trail, bouncy castle and Jolly Roger’s face-painting. Plus get the chance to meet a REAL pirate! Shiver me timbers! As you arrrrr-ive at Anglia Square, you’ll need to head over to the MAP STATION and collect your pirate’s hat, eye-patch and treasure map! All hands on deck as you need to follow the clues on the treasure map to find the gold coins around Anglia Square. X marks the spot! Each gold coin will have a letter. On the back of the map you’ll need to write down all of the letters and work out what they spell to unlock the PASSWORD, Yo Ho Ho! Head back over to the map station and exchange your password for GOLD COINS! Use your gold coins to get your entry to the Captain’s bouncy castle and Jolly Roger’s face-painting, no walking the plank here! The hats, eye-patches and maps are first come first served. The event starts at 10am and will finish at 3pm.